The game is played with two buttons, with the A button firing projectiles from the plane and the B button launching a special bomb attack which uses a bomb from a limited stock of bombs. Power projectiles can be obtained by destroying buildings and armored enemy planes. There are two types of Power projectiles: "P" Power projectiles, that increases the plane's firepower by one level, and "F" Power projectiles, that increases the plane's firepower to the maximum level instantly. The maximum level only lasts for a limited amount of shots. When certain ground enemies and buildings are destroyed, money bonuses appear which give a random amount of points each. When the player reaches the end of the stage, the player has to face a boss ship. 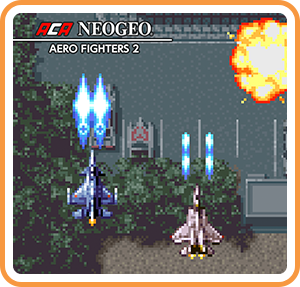 Where can I buy ACA NEOGEO AERO FIGHTERS 2 physical/digital?